To paraphrase Jon Lovitz as Harvey Fierstein, by 1950, Charlie Parker just wanted to loved…is that so wrong? Indeed, Bird had the jazz world in his thrall. His fellow musicians were almost unanimously in awe of him. He had legions of adoring young imitators disciples who bought all his records and followed his every move in and around the club scene in New York City. What more could he have wanted? Two words: Mass appeal. Bird knew that bebop, the avant-garde of its day, wasn’t popular music, and he yearned for the kind of validation that he felt commercial acceptance could give him. Thus, looking to broaden his audience, he did two sessions with string sections of varying sizes, one in late 1949 and another in mid-1950. The first session employed a five piece string section, harp, and oboe.1 The second one upped it to seven string players, harp, oboe, French horn, xylophone, and tuba. Rounding it out was a first class rhythm section of Buddy Rich on drums, Ray Brown on bass, with Stan Freeman (1949) and Bernie Leighton (1950) on piano. From L-R: Buddy Rich, Ray Brown, Bird, Mitch Miller, ?, ?, ? While classical musicians have a reputation for being incredible sight readers, these guys had major problems swinging. One of the many amazing things about Charlie Parker is that, despite being famous for his ability to improvise at preposterously fast tempos, his interpretation of well-known ballads is peerless. Listen as he plays AIP. Without even taking a proper “solo”, he lavishes Vernon Duke’s timeless tune with such stunning invention that he almost seems to be pulling ideas from thin air. Perhaps Bird never quite achieved the level of crossover success that he sought with these sessions. Nevertheless, he was justified in considering these tunes to be among his proudest musical accomplishments. What’s more, he influenced jazz musicians of all kinds to record their own “with strings” albums in the ensuing decades. Classic early Monk stuff, fully formed, in the trio format. Lots of his idiosyncrasies on display. Absolutely minimalist approach to the melody, dissonances where you might not expect them, left hand often playing a single note—almost never the tonic—to imply the underlying chord. He wouldn’t find fame for about another 8-10 years or so, but everything that his contemporaries loved—and hated—is on display. Sarah Vaughan was a household name when I was a kid in the ’70s and ’80s, and I remember seeing her, not infrequently, performing on TV. But it wasn’t until college that I had a revelation. That’s when I read Ross Russell’s Bird Lives! : The High Life & Hard Times of Charlie (Yardbird) Parker, in which he writes of Vaughan’s role as co-conspirator in the nascent bop movement. 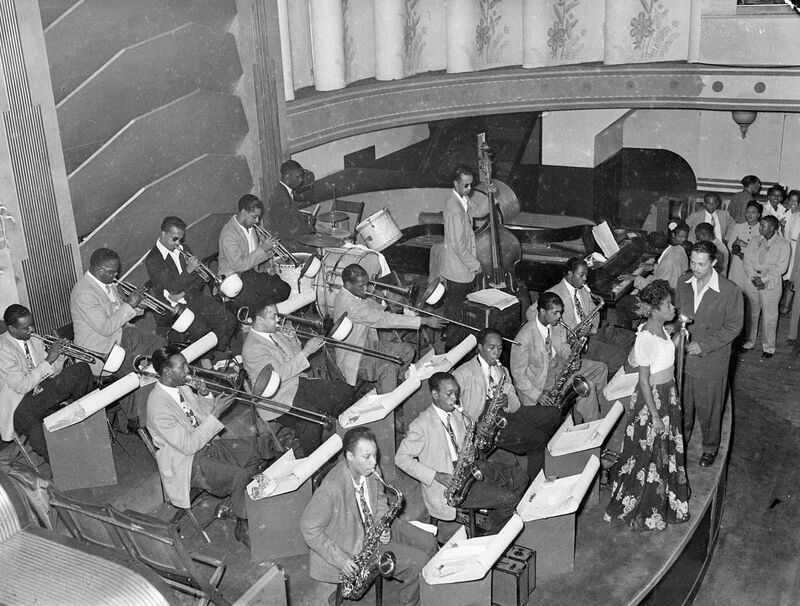 At the time, she, Bird, Dizzy, Art Blakey, and other future mega-stars were all in Billy Eckstine’s big band. In the book, she comes across as being the queen of hipness, a young singer on the same wavelength as the jazz revolutionaries. I had to investigate. As much as I love Ella Fitzgerald and Billie Holiday, I place Sarah Vaughan at the top of my list of favorite jazz vocalists. She has both the beautiful voice and range that Ella has, along with an incredible depth of feeling in her vocals, what we might now call soul. The perfect balance. This version of AIP is from her self-titled album from 1954. On some reissues it’s also been sold as Sarah Vaughan with Clifford Brown. Whatever you call it, it’s one of the best vocal jazz albums in history, and AIP is part of the reason. Imagine you’re flipping radio stations and you hear a few seconds of this track. Depending on which part of the song you happen to hear, you could easily think the singer is a soprano. Or a contralto. Or even lower. No matter where she is in her otherworldly range, she sounds like she belongs there. It’s remarkable. One of her trademarks is to sustain a note without vibrato, then s-l-o-w-l-y transform it with the most beautifully smooth vibrato. My favorite example of that technique in the present song begins at 4:53, when she sings “No one can ever reprise.” It’s on the second syllable of “reprise” and it is stunning. A more fun version than this does not exist, thanks to arranger Wild Bill Davis. The ’50s incarnation of the Basie band was a far cry from the rollicking outfit of the ’30s that saw Lester Young influence a generation of musicians. In the Prez era, most of the tunes that the Count presided over featured head arrangements, in which the band memorizes riffs instead off reading from charts. But by the mid-1950s, more traditional, intricate arrangements became far more important to the orchestra’s sound. And none are more memorable than this one. Benny Powell’s beautifully articulated bridge. Thad Jones’s “Pop Goes the Weasel” quote. And the Count’s own “Let’s try it one more once”, just before the second reprise. The famous studio version is first, followed by one of my favorite movie moments of the ’70s, in which Blazing Saddles‘ Sheriff Bart, on horseback, happens upon the Count Basie Orchestra in the prairie. Because why not? Fluid, contrapuntal variations on the melody, single line flights of fancy, walking-bass with swinging voice-led chords. Often simultaneously. You know, just the basic Joe Pass treatment here. In my judgement, it’s impossible for a Joe Pass interpretation of a standard to be anything less than beautiful. I’m sure he could even transform the intentionally lame “I Wish It Was Christmas Today” from SNL into a lovely Yuletide fantasy. And he makes everything sound so effortless that it’s easy to forget that he is perhaps jazz guitar’s greatest virtuoso. Hey, that’s a great name for an album.